It feels bad at first, especially with the good movies. At some point i'm going to cut the covers off of digipak's, thats going to be hard. I was originally going to put them on sale with a 1e asking price. But i'll probably end up taking them to plastic recycling, if i can find a place that takes them. Never thought i'd do it, but I finally got around to getting one of these. Have been trying to arrange it alphabetically, but that's become so tedious i'm just going to put anything in for the last 100 I have left to do. DVD cases are in cardboard boxes stored in the garage. A collection of almost 2200 here. I have the same, or similar, case (1200 disk). I do it alphabetically. I can't imaging maintaining it otherwise. Initially I put about 600 disks in and used both sides of the sleeve. How I maintain this so it doesn't become overbearing is if I need to insert a disk, I just use a new sleeve with one disk and insert where it needs to go, leaving the back side of the sleeve empty. If there's already a sleeve in or near that space with an empty slot, I use that. 2-disk sets always go on the same sleeve, even if there are two sleeves next to each other with space. Movie covers and inserts, I take out of the cases, flatten and put in a box standing so they can be flipped through. The empty cases are just in garbage bags stored in the shed. I keep track of what's been unboxed and put in the case with a flag in DVD Profiler. Mostly only things we've watched and stuff only I'd be interested in (Obscure horror) goes in to the case. Then, set a filter in DVD Profiler and browse what's in the case without having to look at little labels. It's a lot of work up front, but pretty easy to maintain now. For movies still in their original cases, I have them grouped by interest group (Not necessarily genre). This is to help narrow down when searching for what we want to watch, otherwise it can be a bit daunting. 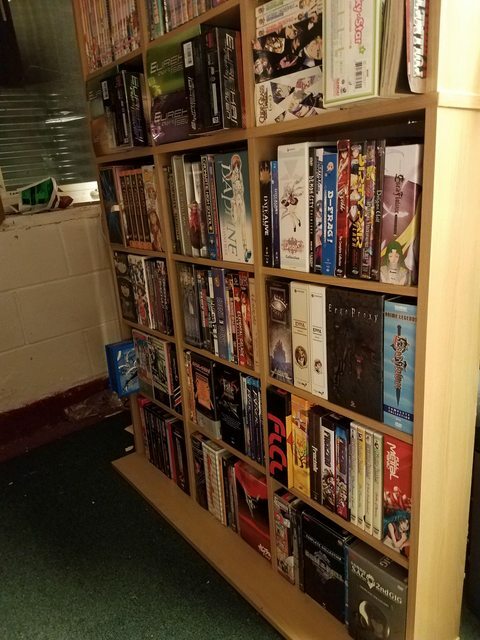 Due to space constraints, box-sets and TV Series' go where they can fit and aren't necessarily stored in any particular order. You're no Daisy at all! Has anyone ever tried the Bellagio - Italia leather book-like binders? 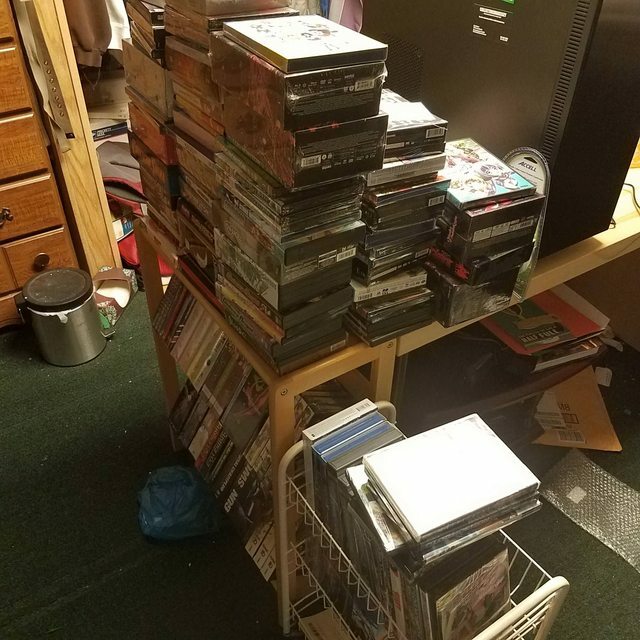 We have decided to get rid of my old DVD shelves because my 2yr is always messing with the DVDs and we worry about the high shelves tipping over. its a bit old atp but shelves, lots of shelves. 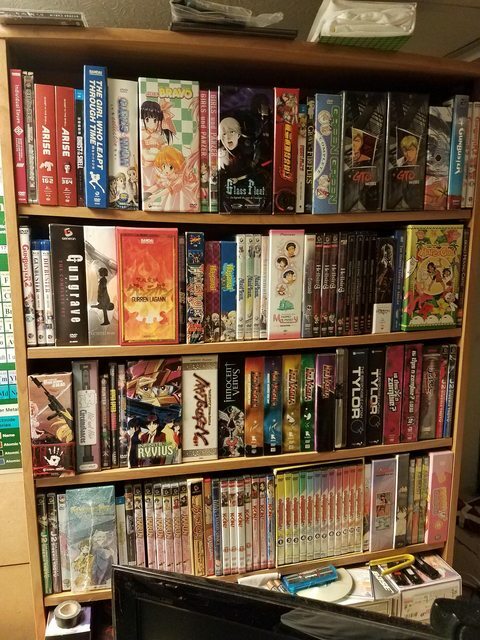 I did basically the same as Mikessou (And noticed we have very similar collections - and RightStuf! boxes all over). 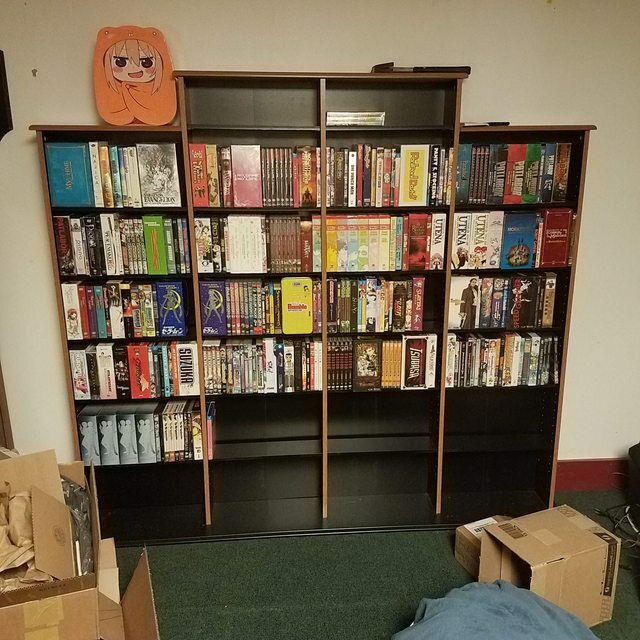 I dedicated one room and set it up library style with multiple rows. Each row is a bit longer then the last to make room for the tread mill (It needs to move out). I had originally wanted to do something like Can-Am.ca does but way to expensive. Is this guy a Invelos/DVDP forum member? This is a crazy collection, and looks more like a shop....must have cost him a mint!! (I'm not sure how to embed a YouTube link here so that the video can playing directly from the thread, so I have to just add the URL to the post below). 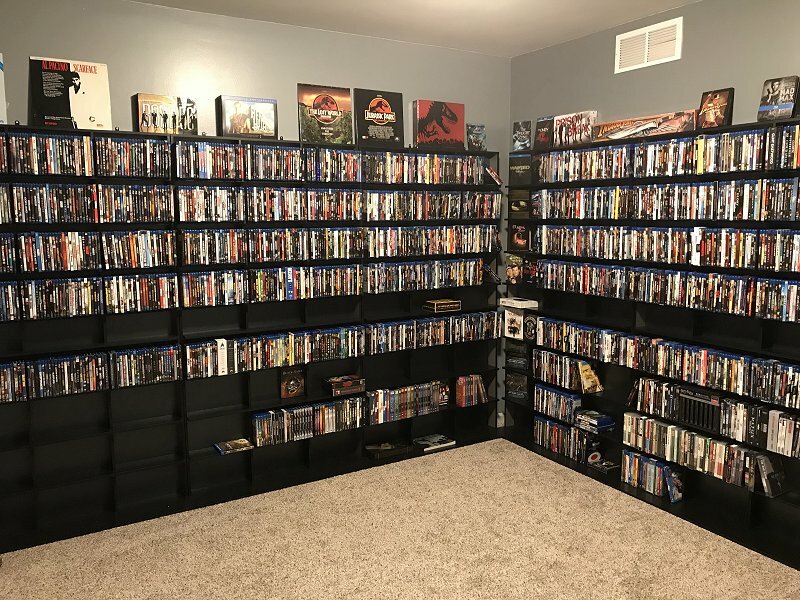 My DVD and Blu-ray collection consists of 4,449 discs at present. The DVD's (705) I also own on Blu-ray are stored in Sony DVP-CX985V 400-disc DVD changers. The Blu-ray's (2,624) and DVD's (1,120) I don't already own on Blu-ray are stored in Sony BDP-CX7000ES 400-disc Blu-ray changers. See the images below. Quite a small footprint for the storage and playback of 6,400 discs wouldn't you say. All the retail packaging is in storage. The physical discs are not organized within the changers alphabetically. They are indexed. I catalog my collection using DVD Profiler of course. Within DVD Profiler each disc is given its own profile and assigned a Collection ID. (Only my disc level profiles are given a Collection ID.) The Collection ID tells me the location of the disc, i.e. the changer and slot number. I only have 2xCX995V and 2xCX7000ES. I'm trying to recall if you ever tried LoadDVD? Latest unreleased version has advanced support for CX7000ES if you care to help me Beta Test. (Oh I see now what software you are using. But the offer still stands). That's quite a hardware collection, but I'm sure Sony thanks you LowPro. The multi-disc changers didn't last too long after Blu-ray arrived on the scene. No, they sure didn't and I'm not really sure Sony is thankful. I originally purchased 6 from my local Sony Style store when they were on closeout. Paid $400 each. The MSRP for a single BDP-CX7000ES was over $1,500 prior to them being discontinued. Purchased the additional 4 changers over the past couple years off EBay. Paid $700 on average. 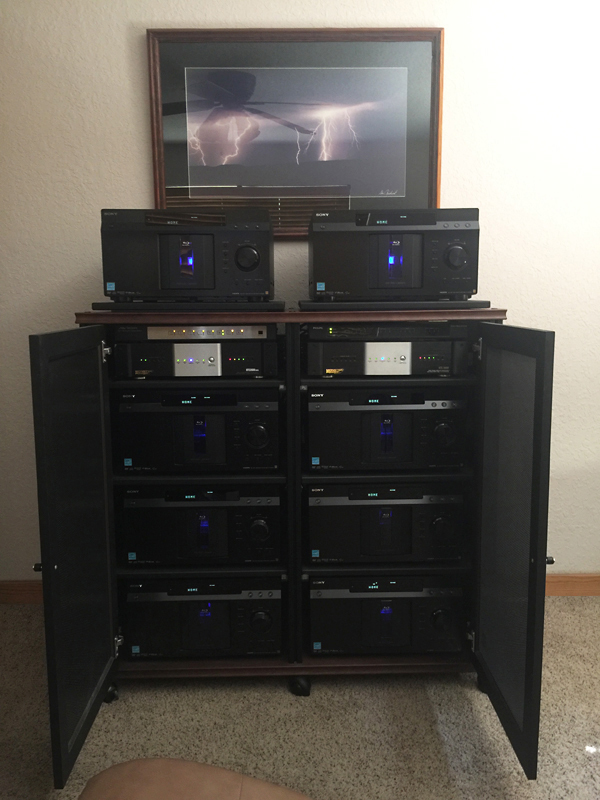 Spent $5,200 for all 10 Blu-ray changers, $520 a changer, $1.30 storage cost per disc. Not bad if you ask me. I've seen people spend that much and more for a single item in their home theater. To each his own naturally. I've been an electronics geek since the days when the only game in town was Radio Shack. 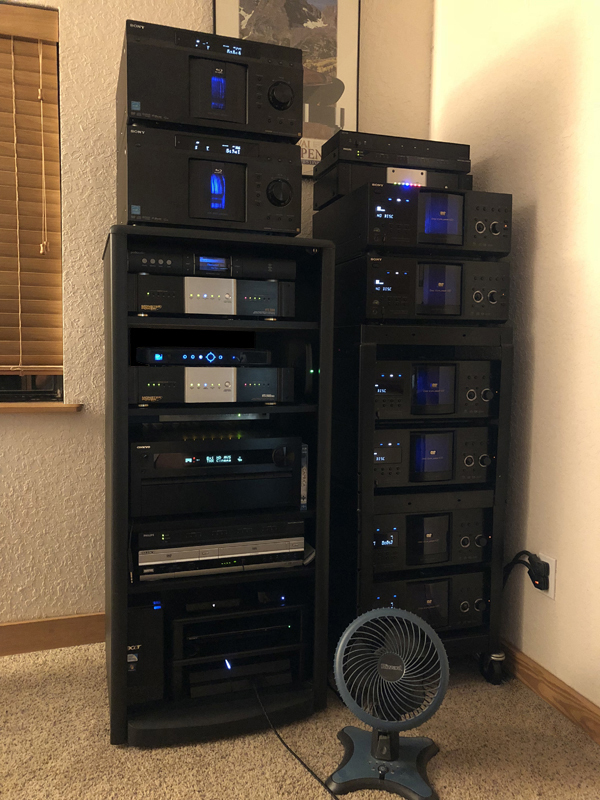 I really enjoyed getting all the hardware setup for this, programming my remote control system and cataloging my collection in such a way that it ties in easily with my system. And while I have no aversion to picking a movie off the shelf and dropping it in a single disc Blu-ray player, I do really enjoy the automated aspect of having my discs stored for playback in the changers. It's also nice to not have the retail packaging running from floor to ceiling throughout my small home. Works for me anyway. A number of years ago I unloaded my changers into a couple of these. I was in between homes at the time and didn't have a place to setup all my gear. Those of you that use these. I would suggest you follow the same practice as I do with my changers. Just number the sleeves indexing the contents. Each disc would get its own numbered sleeve, then make note of the "Location (...which case)" and "Slot (...numbered sleeve)" in DVD Profiler under the given profiles "Personal Information\Discs" section. You purchase a new title on DVD or Blu-ray. The disc gets placed in the next available numbered sleeve. Add the profile to DVD Profiler making note of the location and numbered sleeve where the disc resides. Done deal. If you want to browse your collection alphabetically, do so from DVD Profiler. If you want to browse your collection by Genre, do so from DVD Profiler. If you want to browse your collection by any given number of criteria, do so from DVD Profiler. When you find a disc you'd like to watch DVD Profiler tells you where it's located. Pull your case out, remove the disc, drop it in your player. Bada bing, bada boom. 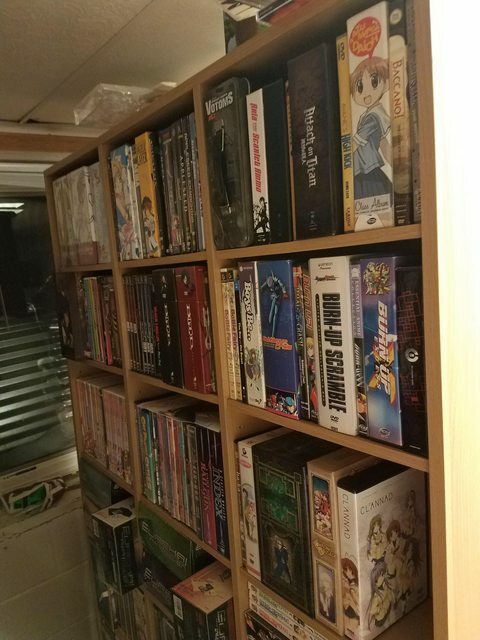 Looking at Pictures of Whole rooms dedicated to Collections makes me wanna get a house since i only live in a tiny Apartment and have over 1000 in my Collection and want several more lol.